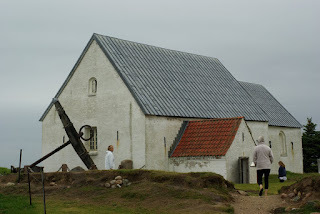 Yesterday evening my friend Orsi and I said farewell to the old medieval church at Mårup, north west of Aalborg. 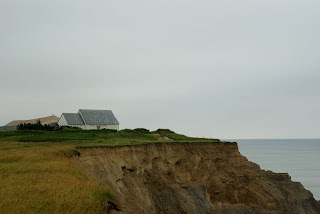 The church, one of my favourite places in Denmark, has been threatened by coastal erosion for centuries, and now it stands right at the edge of the steep cliffs. When the simple Romanesque church was built between 1200 and 1250 AD, it stood over two kilometers from the sea. Even in the late 1700s, when it was modified and strengthened against shifting sand, the distance was over 45o meters. But by the beginning of the last century, the locals had to realize that the days of the church might soon be over. Consequently, they built a new, nondescript church in the nearby village. Since 1928 Mårup church has only been used occasionally, mostly for concerts and similar cultural events. The last service was held here on Easter Monday this year. In 1998 the church was emptied, and most of its furniture taken to the National Museum. 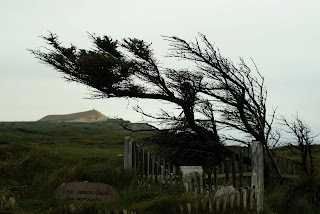 In the meantime, the erosion process accelerated, and now it is only matter of months, if not weeks, before the whole structures tumbles down into the waves below. 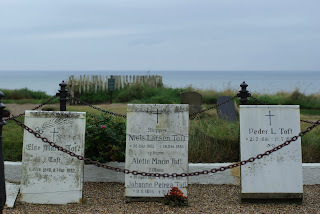 The picturesque old churchyard is largely gone, although the mass grave of 226 British seamen, who died in December 1808 when their ship The Crescent sank, is still there. 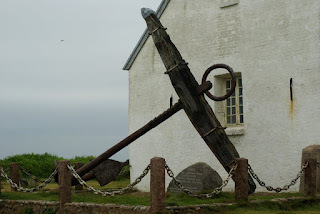 So is the ship's huge anchor that marks the grave. The fate of Mårup church has been the subject of fierce debate in the past decades. The three alternatives that emerged from these discussions were (1) securing the coastline, thus saving the building, (2) relocating the church to another part of the country, possibly to an open-air museum, and (3) letting nature take its course. For a while it seemed like the last (and cheapest) option would be chosen, but in the very last moment the authorities decided to carefully remove the building and store its material until funding and location is secured for a future rebuilding. However, that will be a totally different church, far from the windswept, raggedly beautiful coastline that makes it such a great place to visit. As the deconstruction of Mårup church begins right after the current holiday season, this perhaps most exotic of Danish churches can only be seen for a few weeks. Thank you very much for this post. I was there in 2006 and it was indeed a wonderful place. I could have spent all day there. I'm so glad I took all the photos I did and can hardly believe it's gone, though the danger was clear and I'm glad the church was saved. I do hope the church is one day re-built and in a way that recalls what once was. On a sentimental journey to the places of my ancestors I was priveleged to visit Marup Kirke.My ancestors Larsen-Hansen were baptised,married and buried here.Truly a loss emotionally.Many donated funds to save the dismantling of this beautiful kirke. A result of your post you will, no doubt, be inundated with questions by those whose families have records from this beautiful place. Would you be willing to ask around about all the records from the church? Can you post an address where I could write someone who might have access to those records?